I can’t resist hiking a 100-year old trail—especially one that recently re-opened after being closed for 40 years—so I motored along Highway 101 to Carpinteria and headed for the trailhead at the base of Franklin Canyon. Franklin Trail, back in action after a 40-year closure. If Franklin Trail was a person, it would have a very interesting life story. Franklin was born 100 years ago in the foothills near Carpinteria, cared for in its early years by doting hikers and horseback riders, and was very popular during its early and middle years. At age 60 Franklin was forced into retirement, lost from public view and all but forgotten except by a few friends who remembered Franklin or recalled stories of Franklin told them by earlier generations. Then at age 100, Franklin re-emerged, perhaps a mere shadow of its former self, but nevertheless back in the public eye. The trail and the hillsides it crosses were scorched by The Thomas Fire in December of 2017. I was surprised, even shocked to find lots of hikers following Franklin Trail over blackened slopes just weeks after the fierce and long-lasting blaze. Constructed in 1913 by the U.S. Forest Service, Franklin Trail was a popular way to access the backcountry. 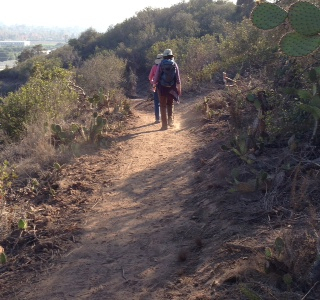 The pathway ascended to the crest of the Santa Ynez Mountains and then down to the upper Santa Ynez River. Heavy metal hiking: Chain-link fence and power towers along Franklin Trail. In 2013, a short length of Franklin Trail was reopened after it had been closed to hikers for about 40 years. Franklin Trail leads from Carpinteria High School to Trail’s End, a distance of 4.5 miles round trip with 750-foot elevation gain. 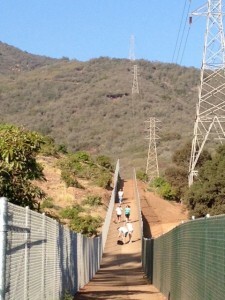 As a tradeoff for public access, the first mile of trail is bordered by a whole lot of chain-link fence. The next mile is more interesting and the trail delivers fine coastal views. Apparently Franklin Trail was a whole lot more fun 100 years ago. Early users of Franklin Trail included students from the nearby Cate School, one of West Coast’s premier boarding schools. A major funder of Franklin Trail was Cate School founder and headmaster Curtis Cate, a big believer in the character-shaping power of the great outdoors. 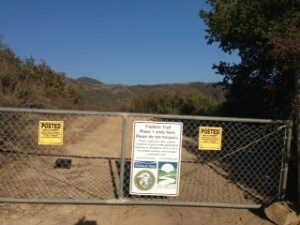 After World War II, avocado farming and commercial flower growing became popular businesses in the Carpinteria Valley and in the 1970s, agricultural interests began sealing off access to Franklin Trail. Local ranchers insisted that horses or hikers could spread avocado root rot, a potentially fatal tree disease into their orchards. Three property owners fiercely fought public access both politically and in the court system. Hikers never regained access to the trail. 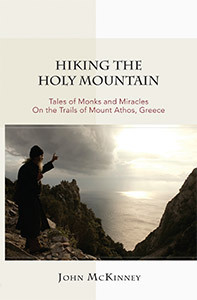 I last hiked Franklin Trail in the early 1980s; I seem to remember my friend Bob McDermott and I starting out from Linden Avenue, walking through avocado groves to a power-line road and finally locating the footpath. We walked a few miles, and got some good views from the neglected trail that was already getting very overgrown, I recall. 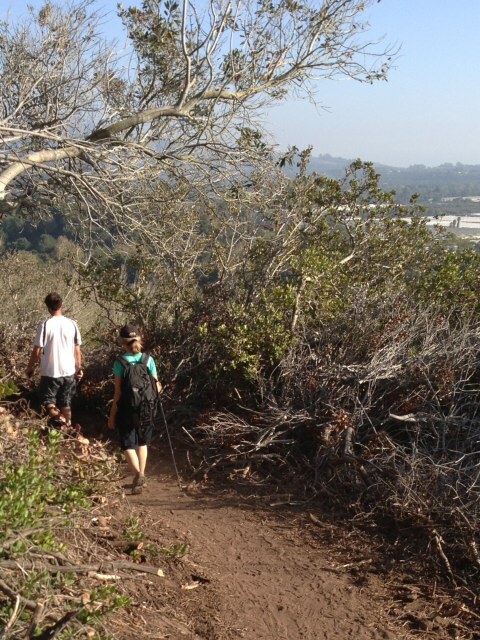 Franklin Trail leads to great views above Carpinteria Valley. A tip of the hiker’s cap to Ray Ford, local trails expert, for his tireless efforts to resurrect the pathway.During the last decade, the Trust for Public Land and The Land Trust for Santa Barbara County, Santa Barbara County Parks, Friends of Franklin Trail, and the Montecito Trails Foundation and other organizations have helped secure a conservation easement, get what is called “Phase I” of the trail built, and plan for the re-opening of the rest of Franklin Trail leading to the crest of the range. Visit Friends of Franklin Trail. (FranklinTrail.org). 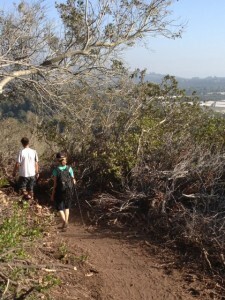 Meanwhile take a hike and dream of the day when 4 more miles of Franklin Trail is re-opened. Expect to see lots of dogs and their owners. 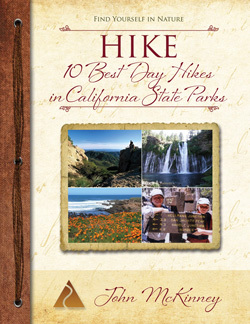 The hike: Walk along the paved path, cross Foothill Road, and locate the signed trailhead near the entrance of the parking lot. Read all about the Franklin Trail at an information board then continue north on the trail along the west end of the high school. The path turns east, and takes a long straight course behind the baseball and football fields and greenhouses. Chain-link fences constrain the narrow path, which turns north and climbs steeply next to power lines. Finally, nearly a mile out, you hit dirt trail, the fences recede and Franklin Trail resembles what we have come to think a trail should look like. 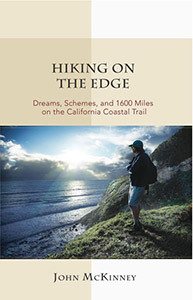 The path zigzags on the brushy south slope and soon delivers excellent vistas of the Ventura-Santa Barbara coastline as well as the Channel Islands. End of the trail–for now. Supporters hope to re-open 4 more miles of historic Franklin Trail. At the two-mile mark, top a knoll and intersect a dirt road. Walk up the dirt road a last 0.25 to a gate across the road—and for now, the end of the Franklin Trail.